Trent Alexander-Arnold says he is closing in on his return to full fitness after recently recovering from a minor injury setback. The right-back managed 13 minutes as a second half substitute in Saturday’s 3-0 win over Bournemouth having missed the Reds’ three previous outings with a knee problem. He had evidently sustained the issue in the warm-up prior to January’s 1-0 win over Brighton, but was still able to last the full 90 minutes at the Amex Stadium. An extended break for Jurgen Klopp’s men is likely to give the Englishman time to put himself in contention to reclaim his starting spot in next week’s Champions League Round of 16 first leg against Bayern Munich. Skipper Jordan Henderson and his deputy James Milner shared the workload admirably in his absence as Liverpool endured something of a mini-injury crisis at the back. To have Alexander-Arnold available again not only restores a sense of defensive continuity and familiarity, but it gives Klopp’s side another welcomed attacking dimension to make use of. 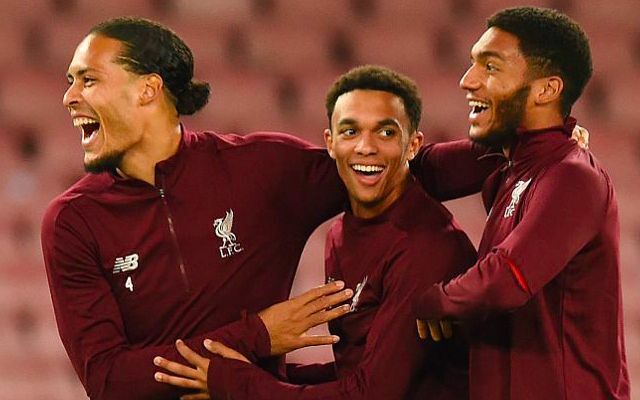 Liverpool are still meanwhile waiting on the fitness of Joe Gomez, with the centre-back facing another six weeks on the sidelines having undergone surgery on his fractured leg. They are still also without Dejan Lovren as the Croatian nurses a hamstring issue that saw him left at home for the club’s warm-weather training camp in Marbella.